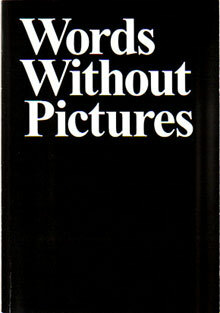 The book is the result of a year-long collection of comissoned essays and public discussions channeled on wordswithoutpictures.org. Beginning November 2007, an artist, educator, critic, art historian, or curator wrote a short, un-illustrated essay about an aspect of photography that was either emerging or in the process of being rephrased. Each essay was available on the website for one month only and often accompanied by public events at Los Angeles County Museum of Art. The essays were proposals, from which the respondents picked up and created new strands of inquiry, demonstrating the multidimensionality of each topic. Contributors include George Baker, Walead Beshty, Sarah Charlesworth, Charlotte Cotton, Shannon Ebner, Paul Graham, Leslie Hewitt, Soo Kim, Alex Klein, Sharon Lockhart, Allan McCollum, Carter Mull, Anthony Pearson, Allen Ruppersberg, James Welling, Charlie White and Mark Wyse.